The Football Association is expected to announce the result of its investigation into Nicolas Anelka's "quenelle" gesture early next week. 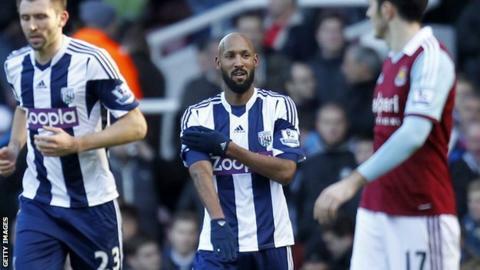 West Brom striker Anelka made the sign, described as an inverted Nazi salute, after scoring against West Ham in the Premier League on 28 December. Baggies sporting director Richard Garlick wants a swift resolution. He would not comment on a report Zoopla is threatening to pull out of its shirt sponsorship deal if Anelka plays on. But Garlick is keen to know whether the 34-year-old striker will be charged for a sign France's Sports Minister Valerie Fourneyron described as "anti-Semitic". The FA has brought in an "expert regarding the salient issues related to the gesture", which Anelka made after scoring in a 3-3 draw at Upton Park. There is a possibility he could be handed a lengthy ban should he be charged and found guilty. "It would help everyone for that investigation to be over as soon as possible," Garlick said. "There are investigations ongoing, and while they are we won't make any comment." New Baggies head coach Pepe Mel's forward options have already been weakened by Shane Long's move to Hull City. Pressed on the matter, Garlick added: "People can speculate there is a turn of events where we might be two strikers down." Anelka has promised not to repeat the gesture, which he said was made in support of performer Dieudonne M'bala M'bala, whom the French government has tried to ban from making the sign at his shows. Kick It Out chairman Lord Ouseley has already criticised the FA over the speed of its investigation. "They said it would take as long as it needs to take to come to a conclusion," Ouseley told BBC Radio 5 live. "We think that's really bad practice. "The Jewish community and the Jewish fans, who believe this has been an anti-Semitic insult and that it should have been resolved, see it as an open-and-shut case, and quite frankly I don't know why the FA has taken so long and is not informing people why it's taking so long." Read more on Nicolas Anelka: Lord Ouseley accuses FA of "bad practice"
What is the quenelle gesture? Read more on Who, What, Why: What is the quenelle gesture?